Hotel Zone at the beach in front of the big hotels. Since I was staying in a smallish hotel in the center of "old" Cancun (i.e. the place where all the Mexicans working in the big hotels live), I didn't know about this and went to Aquaworld which, also in the Hotel Zone, can't be missed. On arrival at Canun airport unsuspecting tourists are given lots of free "magazines" which offer such briliant deals as : "5% off if you eat in restaurant X for $50 and pay with American Express". These magazins always contained advertisments for Aquaworld. activities connected with the sea. It is huge, but my first impression was quite good, even if it appeared to be an extremely commercial outfit, so I enrolled for a OWD course, paid and was given the PADI OWD Manual ("Read the first two modules and come back tomorrow at 9.00"). I returned to my hotel, read the manual and looked foreward to the start of the course. languages. I started (alone) in German and was then asked if I minded sharing the tuition with Eero, a Finnish guy, in English. This wouldn't have been a problem at all if both the instructor teaching and the one correcting and then discussing our tests with us had had a good grasp of the language, which, however, wasn't the case. In retrospect I have to say that the theoretical instruction lacked both substance and quality. I couldn't believe that it was possible for someone who had answered every single question on the dive tables wrong to pass the test. Luckily our open water instructor noticed that and helped Eero to understand PADI's Recreational Dive Planer. session, however, the group size had shrunk to three students (two guys from Japan couldn't swim and then couldn't understand why they weren't allowed to proceed, one had problems equalizing his ears). The pool training was quite good and the instructor quite thorough. I felt never under pressure, as all of the exercises were repeated until everyone felt really comfortable doing them. A new group again, but together again with Eero. Nationality-wise we were well mixed: Mike from the US, Graham from England, Eero from Finland, me from Germany and of course Arturo, our open water instructor from Mexico. Arturo collected us at the quay and gave us a pre-boat briefing, rightly suspecting that none of us had ever been on a big dive boat before. Afterwards we got on board and got another briefing from Arturo during our 1/2 hour trip to the Manchones reef. We discussed the exercises we would be doing during our first open water session and he explained what we could expect to see during the dive. During the briefing I got the impression that Arturo had a sense of humour, knew what he was talking about and that he would be an easy-going, competent instructor. I wasn't wrong. Arturo proved to be a very careful, competent diving instructor. All of the training units were explained to us in detail, then demonstrated and patiently practised. An exercise didn't finish when each of us had managed to do it once, but was repeated again and again until we became really proficient. One of the exercises was a free emergency ascent from 10m, an exercise many organisations don't practice anymore for fear of accidents, but one I think should be part of any dive instruction. You take the regulator out of your mouth, exhale slowly (extremely important - without that there is a high risk of a lung rupture due to the expanding air) and then ascend slowly (<10 m/min). 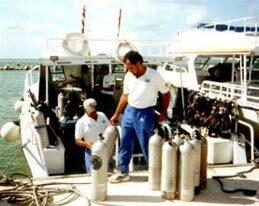 Arturo grabbed our BCD, held his second regulator just inches in front of our mouths, checked that we did in fact exhale and taht we didn't exceed the ascension speed. He always gave us a feeling of comlete safety! Although this exercise is quite controversial, I must say that this is probably the best exercise of them all - it is mentally quite liberating to know how far you get with just one breath of air! During the so-called under water tour following the exercises, Arturo proved an attentive guide, pointing out the beauty of the reef to us. The course was really good fun and our group was excellent: we got on really well. After we had been certified, we had a great time at the bar drinking cocktails while we waited for the Graham's under water pictures to be developed. before my brother arrived from the US. After a dive-free day (I had to recover from the cocktails!) I booked a few more dives with Aquaworld, the first as a certified diver. 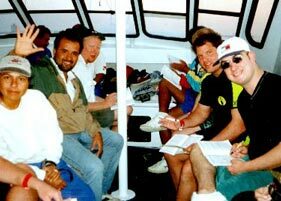 The following paragraphs are based on my experiences and observations during both my instruction dives and the trips after the course. is always necessary (about half an hours depending on the dive site). The boats are very comfortable, with enough space for the divers and their equipment. After the dives it is especially nice to relax on the sun deck on the way home. Briefings take place during the trip, where the location is discussed in detail, including flora and fauna. Since the divers are normaly from a wide range of organisations, under water signs are checked, so everybody is on the same level. Afterward the dive groups are put together and people like me are assigned to a buddy. Just before arrival the equipment is checked for completeness, if someone forgot a piece of equipment there are enough spare parts - even masks and flippers! Finally the divers are helped into their BCDs and off you go! I was, of course a complete novice at the time, but from my point of view, they did their job well, indeed. Know him by his snorkel! few hundred meters from each other. 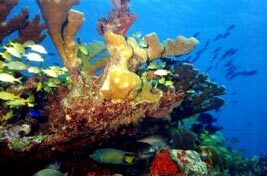 This prevented to much crowding under water - there are several thousand beds in Cancun and a fair shair of the tourists want to go diving! Each dive lasted between 35min and 45 min, depending on depth and air consumption. Normally the boat is not too far away when the groups surface; there was only occasion when we had to wait for about ten minutes, as the group before us had gone in relatively late and we had surfaced relatively early. During this waiting period the dive guides were watching us, checking that noone drifted off. When all groups are safly back on board, the boat heads for the next dive spot. As far as I know all trips are two tank dives and the time between locations is about half an hour. If there was anything special to be seen, or the guides noticed something during the dive (like a diver touching corals) there was a debriefing an the way back to Cancun. 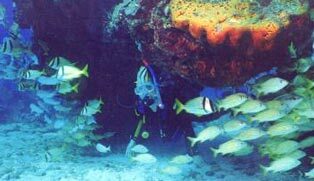 Aquaworld offers three trips a day, one in the morning, one in the afternoon and a single tank dive in the evening. So, what's the downside? 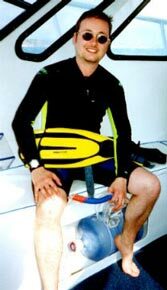 In my opinion dives with Aquaworld are ideal for beginners and people who just go diving on holiday. 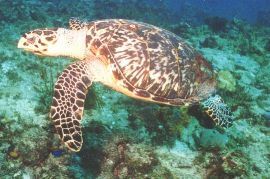 They are well lookes after and will have memorable guided dives. And exactly this is the downside for experienced divers. Since all dives were guided dives, it was impossible to go diving independently. 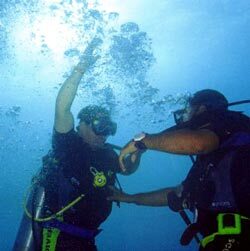 Since the whoile group ascends as soon as one of the divers gets low on air, the overall dive time for up to eight divers is set by the person with the highest air consumption. Back then I didn't mind, since I myself (as a beginner) had quite a large air consumption (though never as much as some) but now I would probably be extremely annoyed if I had to return to the surface with a half-full tank.